Nancy will be one of the speakers on the 2019 IANDS King of Prussia, PA Conference panel on Saturday, August 31, 2019. The title of the panel is Revolutionary Experiences: The Power of Love and Consciousness. Nancy will be speaking about her Near Death Experience at the age of 6 and how it transformed her life. Other panelists include: Darryl Philip, Janet Tarantino and Mary Catherine Volk. The panel will be moderated by Professor Janice Miner Holden, EdD, LPC-S, NCC, ACMHP. She is Professor of the Counseling Program at the University of North Texas in Denton, TX. It’s all about love--to feel the love, to move through life with love, and to love ourselves unconditionally. Love heals grief. It is the highest vibration. Nancy, a spiritual medium/transformational coach, tunes in for heart-full messages from your loved ones on the other side. 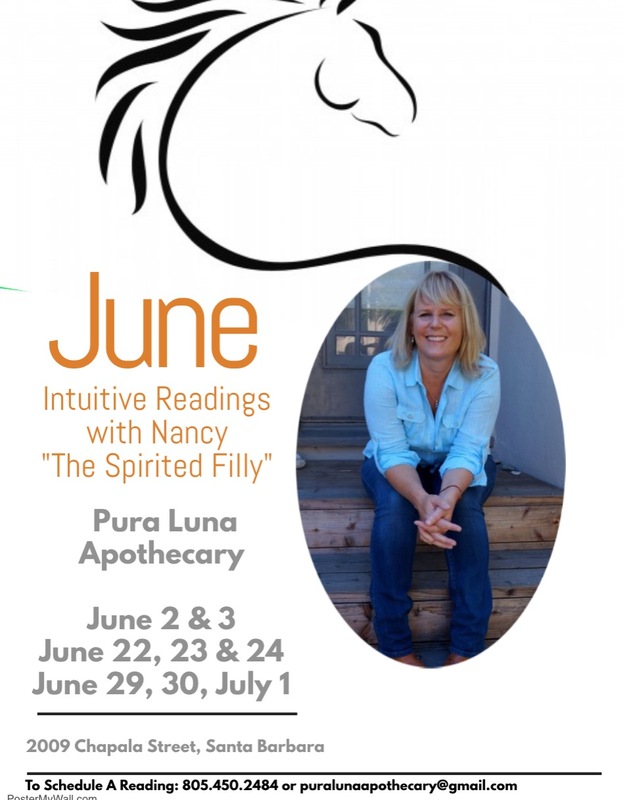 Nancy has studied with one of Great Britain’s top evidential mediums and spiritual educators Mavis Pittilla and also prominent U.S. based psychic mediums. She has conducted an intensive four-year study of dying, death and afterlife, including attending workshops with grief specialist David Kessler, Shared Crossing Founder William Peters, and Visiting Nurse and Hospice Association and Hospice of Santa Barbara. To book an appointment, call PuraLuna Apothecary at 805.450.2484 or email PuraLunaApothecary@gmail.com. Please come join Unmasked Live at Center Stage Theater in Santa Barbara. I have been asked to read two stories from the book, Unmasked, by author Marcia Meier. Seven other women and one man will be reading the stories live on stage. For tickets and information. Unique gifts--Nancy's photo cards and special animal totem dream catchers! Join the Spirited Filly's corral by submitting your email address below to be notified of all future events and workshops!